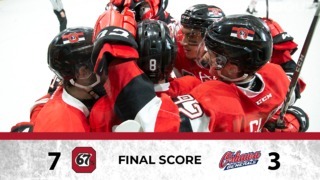 After seeing their 9-game winning streak come to an end last night in the second game of a three in three, the Ottawa 67’s wanted to finish their road trip the right way on Saturday evening, and they did just that, picking up a hard fought 4-3 win in Hamilton. Sasha Chmelevski set the tone thirty seconds into the game, as he opened the scoring with his 21st of the season. 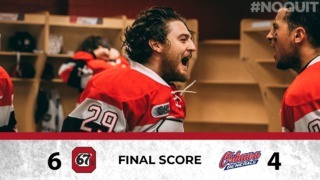 Lucas Chiodo, Alec Belanger both added to Ottawa’s tally in the second, while Kody Clark beat the goaltender in the back-half of the third period with a one-time shot set up by Marco Rossi on the power play to secure the win. For the Bulldogs, Owen Burnell, Arthur Kaliyev and Matthew Strome all found the back of the net. 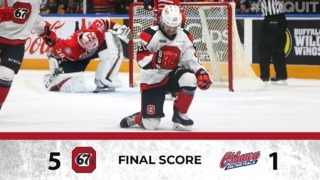 The hosts put a lot of pressure of Ottawa in the final minutes, but Cedrick Andree stood strong, making a few miraculous saves down the stretch. Andree stopped 25 shots on his league-leading 30th win of the season. 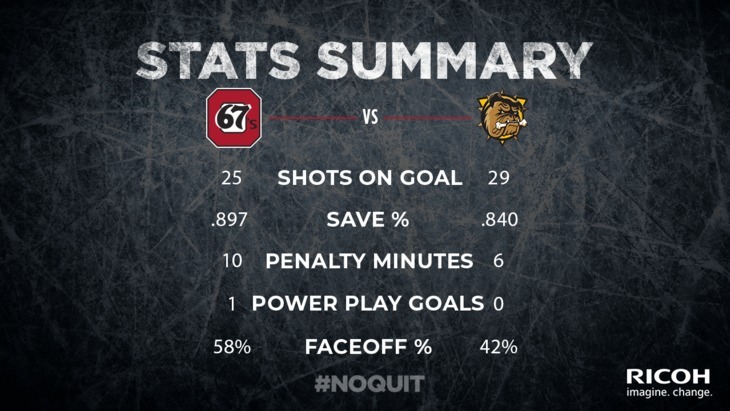 With this win, Ottawa picks up five points out of a possible six during this recent three in three stretch.